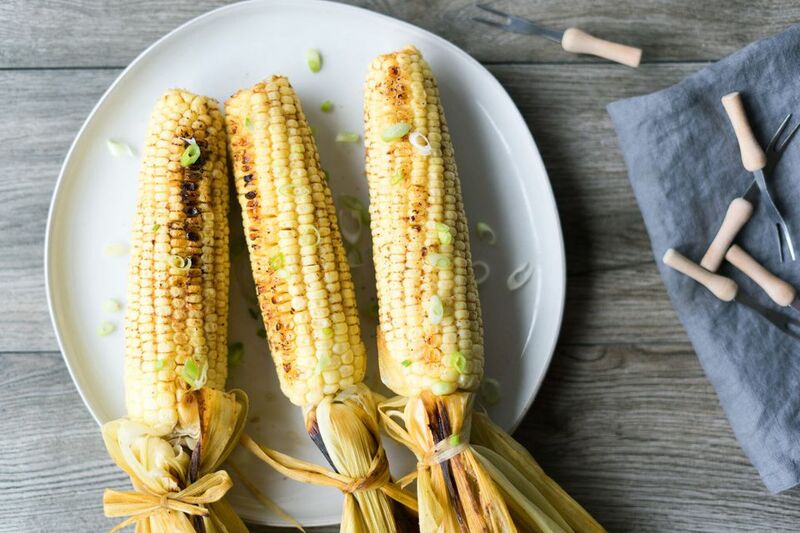 To make a slowly smoked corn on the cob, soak the ears of corn in water for a few hours, then rub down with olive oil and light seasoning. Smoke corn for an hour or so and remember to leave the husks intact. The result is fantastic. Gently pull back the husks on each ear of corn. Remove the silk but not the husks. Place the ears in a large pan and fill with water to cover the corn. Let sit for several hours. Combine olive oil with onion powder, paprika, brown sugar, chili powder, and salt. Remove from water and brush the corn with oil mixture. Pull the husks back over the corn. Prepare your smoker and smoke the ears of corn at 225 F/110 C for about 45 minutes to one hour. When done smoking, pull back the husks, top with green onions and enjoy. Soaking the corn and leaving the husks on while you smoke it will help to steam the corn, while simultaneously ensuring that the corn kernels don't dry out.